In my last post, I introduced a technique called Mechanical Advantage Drop Sets, also known as MADS. This is a type of drop set in which the variable is not the weight but the exercises you perform with that weight. The goal is to go from a position in which you are mechanically weakest (because of either leverage or strength curve) to one in which you’re stronger. In many cases, moving from a strong mechanical position is as simple as changing the distance between your hands or rotating from an overhand grip to an underhand. In others, it’s about changing the exercise itself to hit the muscle in a stronger way. Compared to traditional drop sets, in which you keep the exercise the same and merely reduce the weight, MADS aren’t necessarily better, just a bit different. Not only do you get to keep the heavy weight, but you also get to recruit different aspects of the muscle you’re targeting. Today, I’m going to give you some of my favorite mechanical advantage drop sets for nearly every muscle of your body. Progression: Wide-grip bench press, close-grip bench press, moderate-grip bench press. Execution: Start with a wide-grip bench press, using a weight you can lift for about 15 reps. (Or your “15 Rep Max” if you want to use high-tech fitness lingo.) Once you fatigue, rack the bar, shake your arms out and move to a close-grip bench press. While this is a triceps-oriented version of the bench, you’ll still hit the chest. Perform as many reps as you can, then rack the bar again. Proceed to the moderate or “normal”-grip bench press, where you will be the strongest. Perform as many reps as you can, and rest. How to Use: Perform 2 of these drop sets at the end of a strength chest workout. Bonus: You can use this same setup for push-ups. When it comes to pulling, you’re always going to be stronger with an underhand grip. This is because supinating the hand allows you to recruit the biceps to a greater degree. In this case, a chin-up will be the strongest because you’re using your biceps in addition to your back. Execution: Begin with wide-grip, overhand pull-ups, performing as many as you can in good form. When you fatigue, rest for a few seconds and then perform overhand pull-ups with moderate hand spacing. Perform as many reps as you can until you fatigue. Rest for 5 seconds and finish up with chin-ups, which are an underhand grip. How to Use: Perform 3 of these drop sets at the end of a back workout or on an off day. Note: Some clients find moderate grip more difficult than wide grip. While wide grip is more mechanically disadvantageous, there is also a shorter range of motion. For guys with shorter arms, this won’t make a big difference, but a tall guy will notice. If you want to play around with switching the order, feel free. In this case, an underhand grip row will be the strongest because you’re using your biceps in addition to your back — the same principle as above. Execution: Start with a bent-over barbell row with wide hand spacing, making sure to use a weight you can lift 8-10 times. When you reach failure, set the bar down and rest 15 seconds. From there, take the barbell in a moderate, overhand grip, and perform a few more reps until you hit failure. Set the bar down, and without rest, take it in a moderate underhand grip, performing as many reps as you can. How to Use: Perform 2-3 of these drop sets in place of regular rowing during your back workout. In this case, the difficulty of execution has a lot to do with range of motion and leverage. With a long-stride lunge, you’re moving a great difference but also putting your quadriceps in a weaker position when you’re at the bottom of a lunge. Execution: Take a dumbbell in each hand, performing forward lunges in an alternating fashion. Use a weight you can handle for 12-15 lunges per leg. At this point, the lunge should be long enough so that when you are in the lunged position, the knee of the back leg is pointing slightly behind you, not straight down. When you fatigue, shorten the stride and perform more lunges. With this lunge, your back knee should be just about in line with your front heel. Rest only if you need to. When you reach fatigue, perform dumbbell squats until failure. 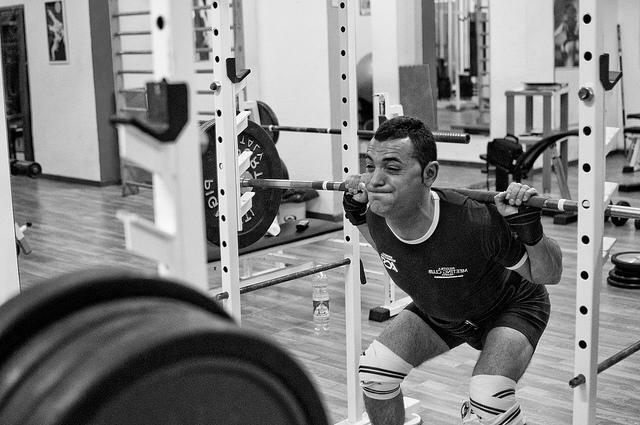 How to Use: Perform 3-4 drop sets in lieu of lunges during your leg workout. Once again, we see the width of the grip factoring in heavily. In the wide grip, your forearms are splayed out and essentially removed from the movement; the onus is entirely on the biceps. Execution: Take a barbell in a wide-spaced grip and curl it with good form until you reach failure; select a weight you can lift for 10-12 reps. When you reach fatigue, set the bar down, rest minimally and reset your grip. This time, you’re taking a very narrow grip. Perform as many reps as you can before setting the bar down. Finish with a “regular” grip bicep curl until complete failure. How to Use: Up to 4 of these drop sets, in addition to the one below, will make a fantastic bicep workout. This one is more for the forearms, and as you fatigue, will incorporate the stronger biceps more. Execution: Using a set of dumbbells, perform reverse curls with a weight you can lift 12-15 times. When you fatigue, rotate your arms into a neutral grip or “hammer” position; perform as many hammer curls as you can until failure. After this, set the weights down, shake your arms out and perform as many traditional dumbbell curls as you can. How to Use: Use in combination with the barbell curl MADS for a complete biceps workout. Of all of the drop sets in this article, this is the only one that requires just two movements; it’s also the one you’re most likely to have seen. Execution: While lying on a bench, perform as many skull-crushers as you can before reaching fatigue (do not hurt yourself, please). Without rest, move the bar forward over your chest and perform as many close-grip bench presses as you can. How to Use: Perform 1-2 drop sets at the end of a chest or triceps workout. Arguably the most difficult of all MADS, this drop set requires the most discipline and the most changes between exercises. Execution: Select a weight that allows you to perform about 15 reps on the bent-over rear delt fly, and work till failure. After that, stand up straight and perform as many lateral raises as you can until you hit failure. From there, perform as many front raises as you can, and finally as many overhead presses as you can. Try not to rest between exercises. How to Use: This works best as a finisher after a heavy shoulder workout (like 5×5) that relies on compound movements. Just one drop set is all you need. This one requires a partner in order to move quickly, but, if you can get it done, it’s a fantastic addition to your chest workout. Execution: Begin with an adjustable bench set to a high incline (60-75). With a weight, you can press for 10-12 reps, performing as many as you can on the high-incline press. When you reach failure, sit up, and have your partner reduce the angle of the bench. 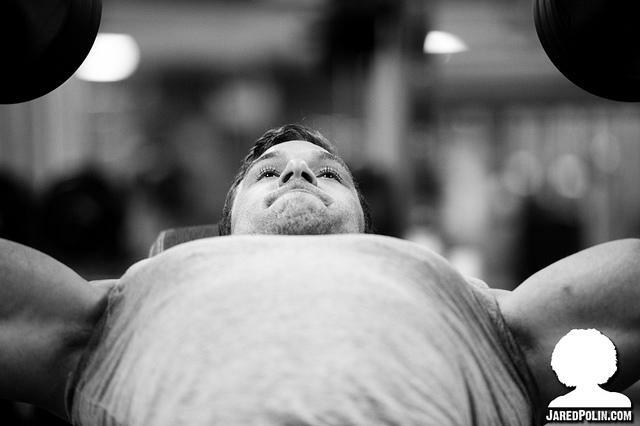 Lay back down and perform as many reps as possible on a mid-incline (45-60 degrees) chest press. When you reach failure, sit up and rest about 10 seconds while your partner adjusts the bench to a lower incline (15-45). Perform as many reps as possible. How to Use: A single set at the end of a chest workout. There you have it: Nine fantastic mechanical drop sets for nearly every part of your body. While the incorporation of these methods won’t make your training any easier, it certainly can help it be more effective. If you’re trying to break through a plateau or prioritize a body part, sprinkle some of this MADS secret sauce on top of your existing workout, and you’ll be making progress in no time. What’s your secret weapon to increasing size and strength for a body part? Leave a comment below!